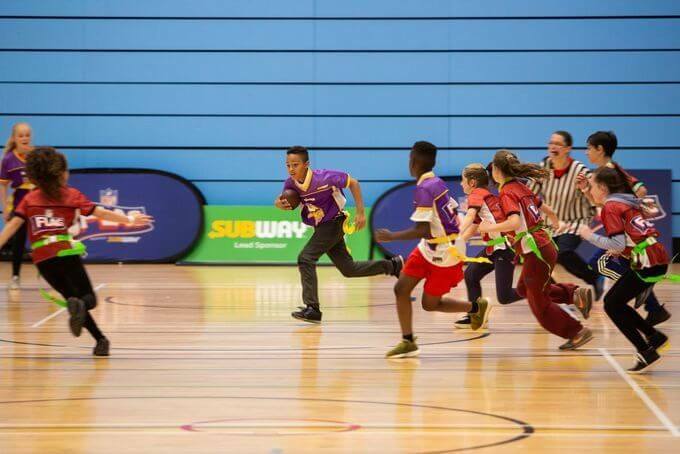 I didn’t know much about NFL (American Football) and still less about NFL Flag until their partners Subway™ UK & Ireland invited me along to a regional tournament at the University of Birmingham. 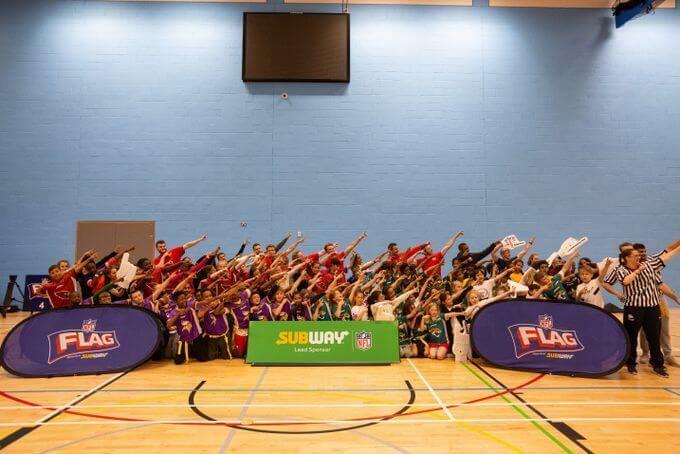 The university has had an American Football team for many years and as part of Subway™’s fun sponsorship programme a number of the students were trained up and sent out to local primary schools to teach them NFL Flag. 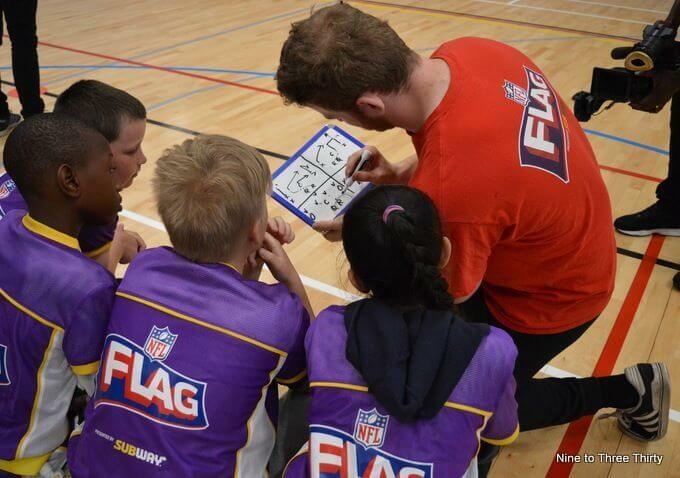 NFL Flag is a non-contact version of American Football and it is aimed at children aged 8 to 14. It’s the fastest growing sport in the UK and Ireland and it’s easy to see why because it’s fast-paced, fun to take part and allows children to use a range of skills, so it’s very inclusive. Each team fields an offensive and a defensive team with only one playing at the same time. The offensive team need to be good at throwing and catching, plus speed comes in useful. The defensive team doesn’t need to throw or catch (so it’s great for kids like H who aren’t that great at those skills), but they do need to try to pull off the offensive team’s flags – these are on the belts they wear around their waists, there’s one on each side and they are easy to pull off with a bit of a tug. Basically at each time a team is either playing offensively or defensively and puts out the right team for the job. The opposing teams take it in turns to attack and they try to score a touchdown by getting the ball to the end of the pitch. The offensive team has 3 chances (known as downs) to advance the ball and try to score, then the teams swap roles. 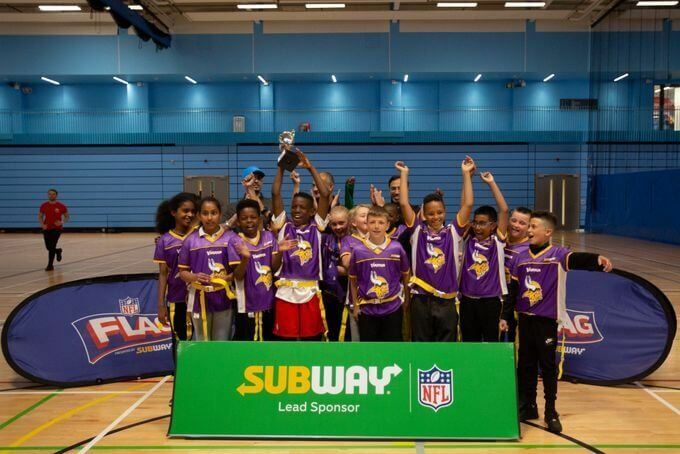 Subway™‘s sponsorship has allowed the NFL Flag programme to create more partnerships with universities, with established American Football teams, to train-up players to become NFL Ambassadors. This allows them to deliver an inspiring 12 week flag curriculum programme into schools for children aged 8-12. It clearly works because the children were able to play well and clearly had a good idea of the rules and also had been able to practise the skills they needed to play the game well. What really struck me about the event was the level of enthusiasm and excitement that NFL Flag was generating. The kids were really fired up. Alongside learning to play, curriculum materials are provided to focus on the NFL core values of respect, integrity and responsibility. The school materials also encourage healthy eating and getting active as well as helping the children learn how to play NFL Flag. There’s quite a lot to think about in terms of tactics for the game and the NFL Ambassadors help the children master the basics of planning an attack. I was really impressed with how keen the children were and how much they had got into playing NFL Flag. There was a lot of enthusiasm which was really great to see and some teams had even brought along supporters to cheer them on. As you can see from the pictures the teams are mixed, which I think is really positive. I really got into the tournament and decided to support George Betts Primary Academy, as a friend of mine has worked there for many years, plus it’s fairly local to me. Their team had clearly worked hard on their skills because they won their first couple of games with ease. As they progressed through the tournament, it got tougher, but in the end I’d backed the winning team because George Betts were the Birmingham winners. 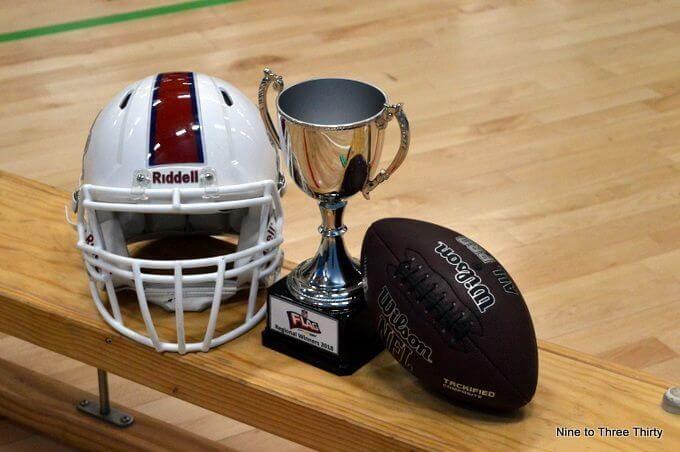 They will be going to London to take part in the NFL Summer Bowl, taking place on 18th July at King’s House Sports Ground in London. 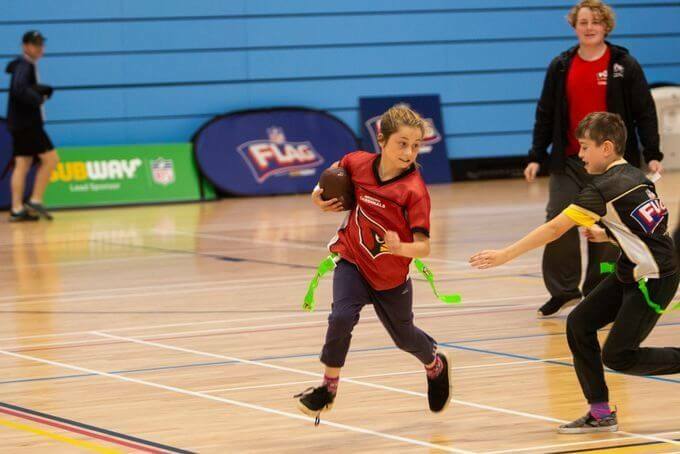 The NFL Summer Bowl is the season finale flag football tournament for UK schools. Well done to George Betts and to all the school teams for playing so well. If you’d think your child’s school would benefit from the NFL Programme, you can encourage them to register their interest here to find out more about the scheme. Disclosure: This post is in association with Subway™. It does look like an exciting game to play and I like that it has different roles for different players. I’ll send it onto my daughter’s school. What a great programme for schools to get involved in! I hadn’t realised there was so much to American Football. It looks like a lot of fun. I can’t believe that flag football is the fastest growing sport in the UK! This is such a cool and unique programme, we need to get kids more active and introduce them to more sports! Hi, Thanks for presenting such a kind of awesome kids sports programme with us. Recently I have just started an NFL flag only for kids. I observed the most interesting thing that the kids are very enthusiastic to play NFL flag. When I see they are enjoying the game so much then my mind flooded with joy. You can also have a look at their joy playing NFL flag.